With Fathers Day weekend around the bend, I thought it would be a great idea to prepare side dishes that would accompany any great grilling or BBQ festivities. I love cabbage, I can eat it raw, cooked, in soup, or off the cutting board as I chop it all up. Too much of it and we all know it can be a little, shall we say, disruptive, but all in all I can eat it all year long. As I was leaving my pre orientation meeting to at The International Culinary School at The Art Institute of Portland it was sunny and the air smelled of smoky grilling everywhere. 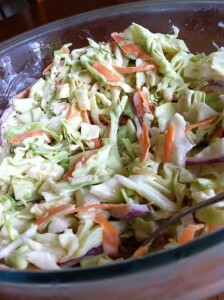 That is what prompted me to make this slaw with chipotle, I hope you like it, I thought it was super yummy. 1. Start by peeling and shredding the carrots. You can either use your cheese grader to shred, or place you carrots in a food processor to shred. Slice the red onions thinly, and chop the cabbage also thinly. Put in a larger mixing bowl. 2. Put mayo, rice vinegar, salt, pepper, and chipotle in a mixing bowl. Whisk together until combined well. 3. Pour the dressing over the veggies, and voila, a healthy, fresh, crispy, yummy. note: see a helpful tip on how to cut the core of a cabbage in the tips and trick category. Thank you for the tips inside this article. I will be back to read more of your articles and I have bookmarked this web site. Keep up the good work! Wow that’s awesome! I am glad and here to help, thank you very much! I have checked it out on a few different computers, and no problems on my end. Let me know if it changes for you?